Please register for this exciting meeting! Limit 20. The May 5th Boatbuilders Meeting will be held once again at Strawbery Banke from 9 to 12. 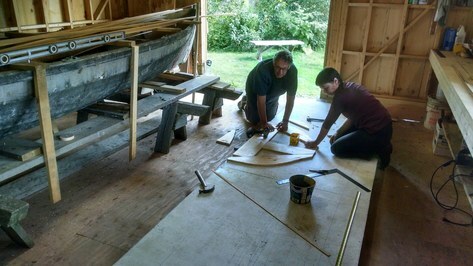 At last years meeting, we met with many of the volunteers who helped build the new boatshop. It was a wonderful way for all of us to learn about each others organizations. We then walked across Prescott Park where Molly Bolster, Executive Director of the Gundalow Company, gave us a tour of The Piscataqua, launched in December 2011. This year Nate Piper will bring us up to date about last years activities at the Boatshop. We can also report on our boat building activities. Bring pictures. We may then participate in the building of the Wherry! Our group is registered for the May 5th morning session. Limit 20. HANDS ON BOATS is designed for adults who are interested in wooden boats and want to be part of constructing a new boat while learning-by-doing alongside a master boat builder. From May-October 2018, HANDS ON BOATS will continue construction of a replica Piscataqua River Wherry based on the lines off of an historic vessel, which is part of the Strawbery Banke Museum collection. The project is broken into phases focused on a particular aspect of construction, with multiple session days offered during each phase. Sessions are offered full or half day (morning only) and are limited to six participants to ensure ample opportunity for one-on-one interaction and guidance. 2017 participants documented the historic vessel, lofted the new boat and created the patterns and molds. 2018 participants will have the opportunity to work alongside a master boat builder construct the stem and transom, plank, build the bottom and thwart risers, install the thwarts and rails, and complete the finish work.